Spring is just around the corner and I have been getting my gardening supplies ready. If you’re thinking of making your very first succulent container garden, now is the time to do so. I will show you how to plant your very first succulent container garden and plenty of other potting tips right here. You can either use a single succulent plant or combine a variety of plants together. It all depends on what you want to do. The size of the plant or plants should determine the size of the pot you are using, and vice versa. Does the size of the pot matter? Yes. Succulents have shallow roots and do not require very deep pots with a ton of soil to grow. In fact, succulents prefer a somewhat shallow pot, or just enough soil to encourage the roots and the plant to spread out. 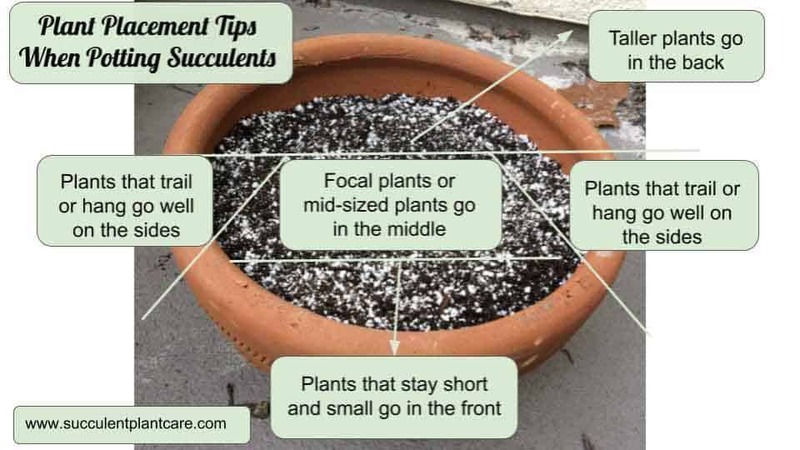 Whether you choose the plant first and then the pot second, or have the pot first then choose the plants to go in the pot later, you want the size of the pot to correspond with the size of the plant(s) you are using. You don’t want the pot to be too large for the plant, but you want to give the plant some room to grow too. A good rule to follow is to have the pot about 1 or 2 inches large in diameter than the current nursery pot the plant is in. Which type of pot to use is mainly a personal choice. There are pros and cons to all of them. 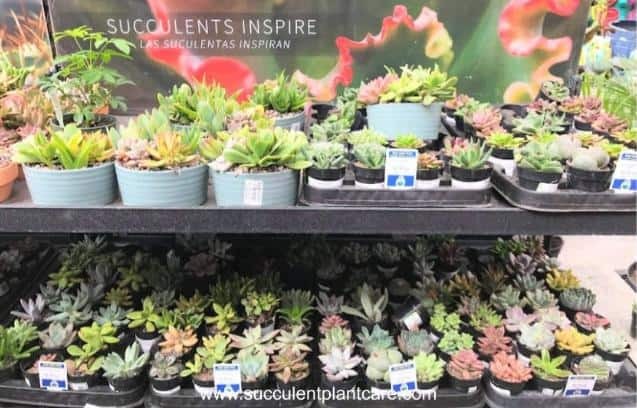 Here’s an article that I wrote that you may find helpful about how to choose the right pot: “Choosing The Right Pot For Succulents: Pros and Cons”. The types of plants you want to use, including the color schemes, color combinations, shapes and sizes largely depend on your own personal taste. There really isn’t a right or wrong way of combining succulent plants. The only thing I am careful about when combining plants together in one container is their growing needs. As much as possible, you want to put plants with similar growing needs in one container. If you’re unfamiliar with a plant’s growing needs and the label does not provide you with basic instructions, just do a quick search to find out what the plant’s basic growing needs are. Place plants with similar lighting requirements together. Whether placing them indoors or outdoors, put plants with the same lighting requirements in the same container. Place sun-loving plants together, plants that need to be in partial shade together, low-light plants together, etc. This will make it easier to find the best spot for your container plants and will make it easier for you to move them around as needed to suit their lighting needs. Luckily, most succulents have very similar watering needs so I don’t worry about watering needs too much when combining plants. But you do need to know that certain succulent plants have very different watering needs so it is best to plant them in separate containers. For instance, Lithops (Living Stones) have very specific watering needs than other succulents and will not do well when planted together and watered alongside them. Find out about the plants’ hardiness zones and the best environment for that particular plant. Try not to mix cold-hardy plants with plants that are not, or tropical cactus with desert cactus. Putting plants with the same growing needs will make it easier for you to care for them in different seasons. It may sound like a lot of work to figure these three things out, but a quick search is usually all you need to find out about a particular plant. Or if you purchase the plants from a garden center, they usually come with a tag or a label to tell you their basic growing needs. You can also ask the person at the garden center about the plant’s growing needs. What is the best soil to use for succulents? Succulents do not like to sit in wet soil for very long, therefore they need a well draining soil. The best soil for succulents allows for fast air and water exchange in the root system of the plant. What I like to use is a combination of cactus potting mix and perlite. The perlite is for better drainage and aeration. I usually do a 1:1 or 2:1 potting mix to perlite ratio. I do not do exact measurements but eyeball it. You can also add coarse sand in the solution for extra drainage (1:1:1 solution of potting mix, perlite and coarse sand). The more humid your area is, the more porous you want your soil to be to let all the excess moisture drain out. 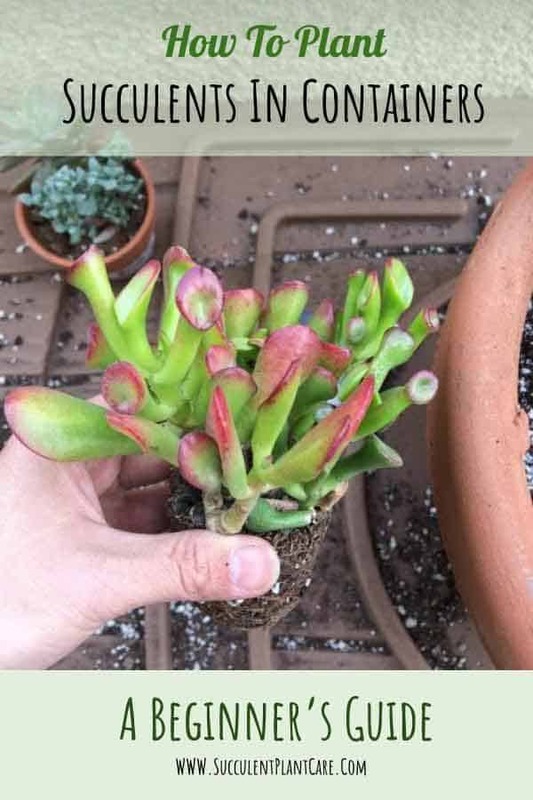 Can you plant succulents in regular potting soil? Yes you can. 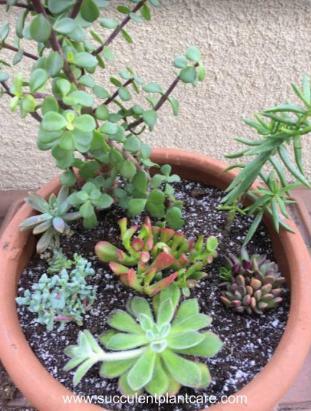 In fact, when I planted my very first succulent container garden, I didn’t know any better and used a regular all purpose potting mix. The plants are doing well to this day and have stayed in the same pot for 7+ years as I am writing this right now. That’s because other things come into play such as watering techniques and sunlight in how your plants do overall. But providing the most suitable potting mix for your succulents right from the beginning will give your plants a better chance at surviving and thriving. When using a regular potting soil for succulents, it is better to augment the soil to add drainage. Add perlite or pumice to the mix, about 2:1 solution of potting mix and perlite. 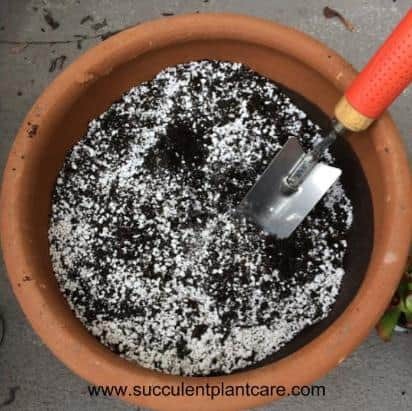 For more about soil and soil recipes, I have written a more detailed article on this topic right here: “Best Soil and Fertilizer For Succulents and Cacti”. For recommendations on where to purchase succulent soil and soil amendments, visit my resource page. 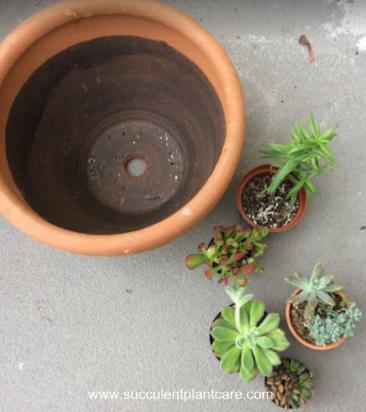 Can you plant succulents in pots without holes? Yes. 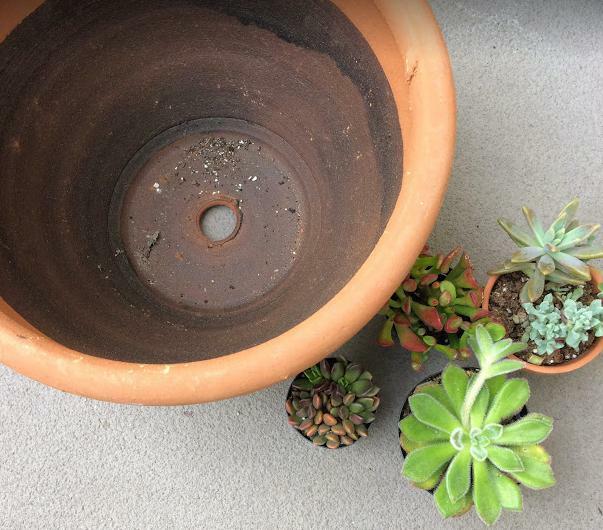 While not ideal, it is possible to plant succulents in pots without holes. You just need to be extra careful with how you water your succulents because excess water will not have anywhere to go so your plants will be extra susceptible to root rot. I have some succulents in pots without drain holes and they are doing well and thriving. I also tend to underwater more than overwater all of my succulents. You need to remember to move the plant in the shade if you are expecting a lot of rain or your plants can drown in all that water pooling in the pot. When this happens, pour out the excess water from the pot and allow the plant to dry out. Do not water again until completely dry to prevent rot. The rule of thumb with watering succulents is, give it a good drink of water then leave it alone until the soil feels dry. The top inch of the soil needs to feel dry before you water the plant again. Just for reference, I live in a dry climate and I water my outdoor succulents once every 7-10 days in the summer and about once every 14 days during cooler months. I stop watering altogether during winter months when we get a lot of rain in my area. If your plants are indoors or if you live in a humid climate, you do not need to water as much. 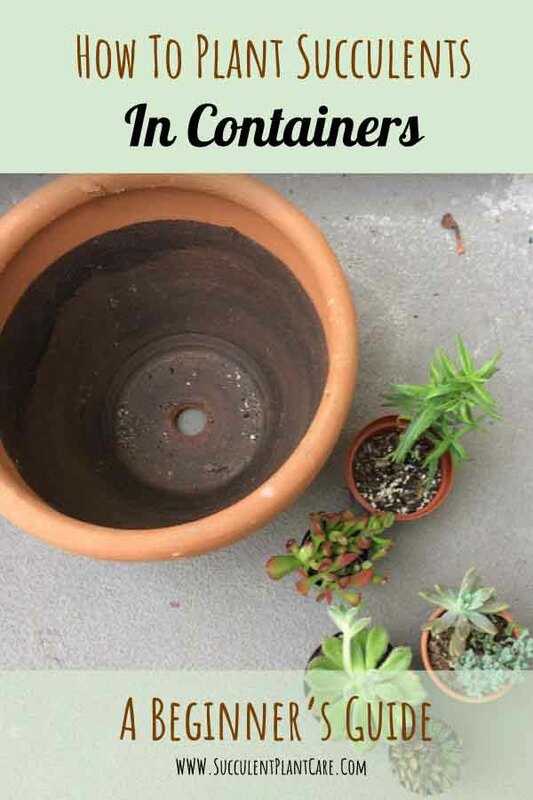 To read more about how to keep your succulents alive in pots without holes, visit my post “How to Grow Succulents in Pots Without Drainage Holes”. For more tips on watering your succulents, visit my post where I give very detailed advice on proper watering: “How and When To Water Succulents and Cacti”. You may find these tools useful to help you gauge the moisture level of the soil: moisture meters. Can you plant succulents in just rocks? Again the answer is Yes. Succulents have built-in survival mechanisms that allow them to survive for long periods of time under harsh conditions. That’s because in their native habitats, they grow in areas where most other plants will not survive. When planted in just rocks without soil or moss, succulents will eventually seek out moisture and shoot out air roots. Succulents can live in this condition for an indefinite amount of time. Mist the plants periodically, aiming for the base or the roots to allow some of the water to be absorbed by the plant and to prevent the plant from completely drying out. Eventually, no matter how you care for the plant, it will seek out a more suitable medium in which to grow in. Simply remove the plant from the rock and plant in a suitable potting mix. Before you start planting, do a little test fit to see if the plants would fit in the pot. This also gives you a good idea how the plants look together in the pot, or which plants will look better next to which. You kind of get to mentally know where each plant will go in the pot before you start planting. Fill the pot with a suitable potting mix (see above for suggestions). Remove the plants from their nursery pots. Remove some of the soil from the plant. You do not have to remove all, just shake up the old soil a bit to loosen the root ball. Start from the back of the pot and work your way down. Plant the taller plants in the back first. Plant the center and the sides next, then the front. Fill in any spaces with potting soil and pack the soil in around the plants to secure them. Top soil. You can add topsoil to give it a more finished and polished look. I have stopped using topsoil when I realized that it was keeping the soil too moist and the soil wasn’t drying out fast enough. I also like to see what’s going with my plants and it is easier to see clearly without the topsoil. It’s a personal choice and you can see for yourself which one works for you. Water the plant thoroughly and do not water again until dry. Some people like to wait a few days before they water their newly potted succulents. Some people water the plants right away. Personally, I do both depending on the state of the plants. Some plants are very wet when newly purchased because they may have been overwatered where they came from. If that is the case then I wait a few days before I water. If the plants are dry then I water right away. Use your discretion. How Far Apart Should You Plant Succulents? Ideally speaking, you want to leave a little room in between succulents (about an inch or two) to give them room to grow and expand. But you don’t want to leave too much room between plants and have the plants sitting in too much soil. This can cause problems such as too much moisture in the soil. The more soil the pot contains, the more moisture it can hold. So you want to be careful not to have a pot that is too large for the plants you have. 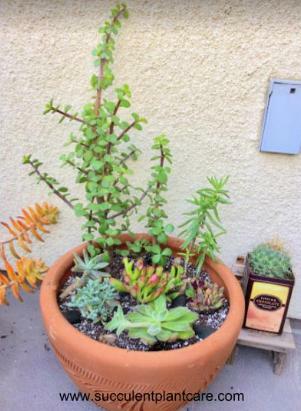 On the other hand, you can fill the pot to the max and not leave an inch of space in between succulents if that is the look you are going for. Succulents will be fine when they are tightly planted and crowded in a container. The plants will not expand and grow as much when tightly compacted, but that also means they can stay in that arrangement longer. I personally like to leave room for my plants to expand and grow on their own in the pot. I take pleasure in seeing my babies grow and multiply on their own. But some people like that compact look. It really does give it a nice, polished look. As long as your succulents are not sitting in too much soil, you can arrange them tightly or a few inches apart and they will be fine. This arrangement works very well for containers intended to be viewed from one side of the pot, where you have a front and a back. These containers are usually placed against a wall or a fence, or next to other pots outdoors. Plants that grow tall or taller plants would look great in the back. You do not want tall plants to get in the way of the sun from reaching the shorter, smaller plants. If you make a mistake and do not realize until later on that the plant you planted smack in the middle of the planter can grow really tall and block the smaller plants, a quick and easy fix is to simply pull the plant out and repot somewhere else, which is what I did with mine. This happened to my plants here “Revamping an Overgrown Succulent Fairy Garden”. I had plants that grew very large and tall that caused some of my plants to etiolate or stretch. Generally, you want to place your focal plant or plants in the center, provided they do not grow very tall. If they grow tall then place them in the back. You want the plants in the middle to be mid-sized plants that are not too short but also not too tall. Ideally you want these plants to be attractive, interesting, or unusual-looking to provide a point of interest in your container garden. It is up to you personally what you consider to be a main attraction plant to place in the center. As mentioned above, you do not want your plants stretching to get more sunlight. To prevent this from happening, smaller or shorter plants will do well in the front where the sun can hit them and there won’t be any plants blocking them. If you have plants that hang, trail or cascade down the pot as they grow, they look best when placed on the sides of the pot or the front of the pot where they can do their thing and spill out of the pot like they’re supposed to as they grow. These 3 terms are often used to describe what types of plants to plant in container gardens. You want a good mix of plants in the pot that consist of these 3 things, but they are not a must. Briefly, thrillers are plants that grow tall and add height and drama to the arrangement. Fillers are those plants that make up the bulk of your pot. These are the small and mid-sized plants that fill your pot. Spillers are plants that hang or trail and look best on the sides or the front. Prepare your pot and the plants you plan to use. Do a ‘test-fit’ to see how the plants fit and look in the pot. Prepare your potting mix. I combined cactus mix with perlite. Remove plants from nursery pots. Loosen the root ball a little. Start from the back and work your way down. Plant the taller plants in the back of the pot. Put mid-sized plants in the center and smaller plants in the front. Place plants that trail or hang on the sides or front of the pot. Instead of a topsoil, I added some ornamental rocks to finish the look. 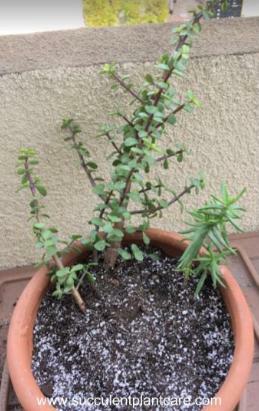 Portulacaria Afra ‘Elephant Bush’ and Crassula Tetragona ‘Mini Pine trees’–these plants grow tall so they were placed in the back. Crassula Ovata ‘Gollum’ (Gollum Jade Plant) in the center of the pot. This is a mid-sized plant that also adds interest and drama to the arrangement. Plants on the left side: Oscularia Pendunculata and Graptosedum ‘Francesco Baldi’. These two plants tend to grow long and leggy stems and will look great cascading down the side of the pot later on. Plant on the right side: Anacampseros Rufescens–a low growing succulent with beautiful rainbow colored leaves. This adds a pop of color and beauty to the arrangement. Plant in the front: Echeveria ‘Doris Taylor’–a low growing succulent with fuzzy leaves. Looks great in the front and adds a different texture to the arrangement. There you have it. These are the basic things you need to consider when planting a succulent container garden. With just a little effort, you will be able to enjoy these container gardens for years to come. Wondering where to purchase succulents online? 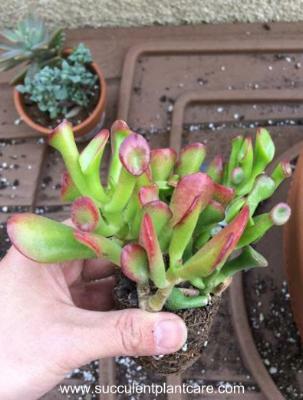 Visit my resource page for recommendations on where to buy succulents and specific plants. Save this for later by Pinning it to your board! Click on my resource page for recommendations on where to find some of the succulents I used in this arrangement or where to purchase succulents online. NextWater Therapy for Succulents? Can Succulents Live in Water?